Premiere Pro CC 2015 Test Prep Released! Today, we are excited to announce the release of our Premiere Pro CC 2015 Test Prep course. LearnKey’s Premiere Pro CC 2015 Test Prep course is a complementary resource to go along with the Premiere Pro CC course, authored by Expert Ryan James. Although the Premiere Pro CC course readies you for the Premiere Pro CC exam, there are new objectives and types of test questions which are covered in the Premiere Pro CC 2015 Test Prep course. LearnKey Senior Instructor Jason Manibog takes you through these changes, so you will have the tools you need to confidently pass the Premiere Pro CC 2015 exam. MTA HTML5 Application Development Fundamentals Released! Today, we are excited to announce the release of our MTA HTML5 Application Development Fundamentals (98-375) course. The Thanksgiving holiday is coming up at the end of the week (at least for us in the United States), and you know what that means: Holiday Hours. 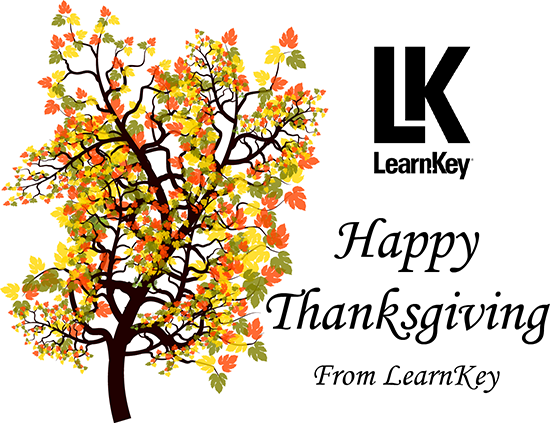 We wish everyone celebrating a happy Thanksgiving, and hope everyone has plenty to be thankful for!